Fredrikstad Mekaniske Verksted (FMV) delivered its first steamship in 1873. By the turn of the century, shipbuilding was a considerable part of the business. In 1909 FMV became the 7th largest employer in the country. At its peak the company employed around 2.500 men and women at the facility. Counting suppliers, the business gave work to as much as 7000-8000 people in the region. In the 1980’s the business became more focused on the offshore industry. The facility and structures on the property was constantly adapted with both permanent and temporary structures being added to accommodate the changing needs. The FMV area represents, with its large buildings and open spaces right outside the modern city centre, a considerable resource for the city and region as a whole. The development of FMV is of great importance to the municipality and its stakeholders in order to stay relevant and compete with other cities along Oslo Fjorden. Due to the property’s size and complexity, the development will have to progress over a considerable period of time. The uses and qualities the area will have when completed will mostly be marked driven. However, as signaled from local authorities and the community the area should house a variety of functions, all contributing to Fredrikstad’s and the regions competitiveness in the future. Because of the projects significance and the long development phase, it is important that development stakeholders and local authorities have a consolidated vision and goal for the area. The FMV yard is approximately 680 acres in size, and Jotne Eiendom owns approximately 140 acres. The seafront location near the city centre provides the area with unique qualities. 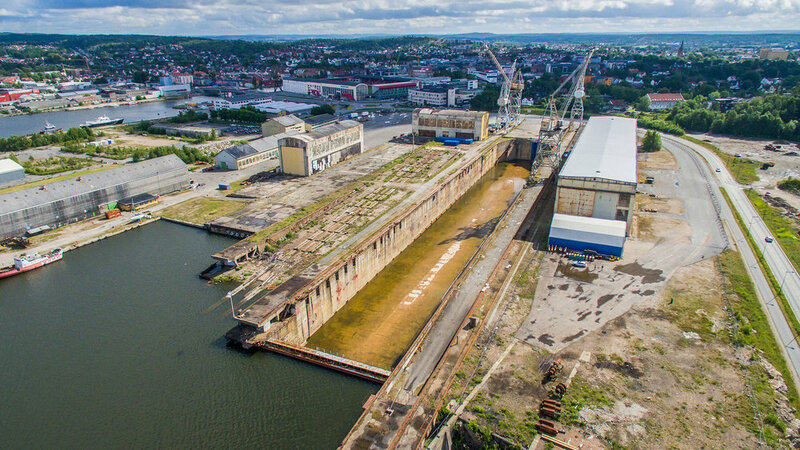 The existing structures includes one of Scandinavia’s largest dry docks, large production halls and heavy duty cranes, some of which are considered important to the city’s history and identity and will be conserved in its form for new uses in the future. FMV-område skal bli en like viktig ressurs for Fredrikstadsamfunnet som det var under perioden med skipsbyggingsvirksomhet. FMV-område skal utvikles til å bli en helhetlig ny sentrumsbydel, med et mangfold av tilbud og funksjoner knyttet til bolig, næringsvirksomhet, opplevelse og fritid. Det er en målsetting om redusert CO2 utslipp og redusert bilbruk. 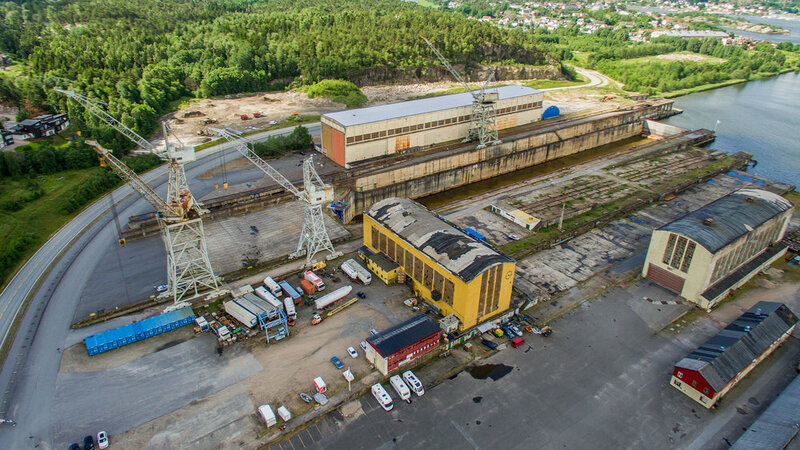 Området rundt tørrdokka, med sveisehall 1 og 2, er viktig å bevare som en del av den lokale kultur- og industrihistorie. Ambisjonen er at kommunedelplanen skal gi rom for en hensiktsmessig bruk av disse områdene. Utviklingen langs elverommet skal bidra til å styrke dette som et viktig byrom. Område skal utvikles med god arkitektur og design og ha en høy miljøprofil. Det er en intensjon om at FMV-område skal utvikles som et pilotprosjekt i Framtidens byer. Området skal utvikles med et variert boligtilbud.